Read race results/race report and check the route of Milan- San Remo 2016. Milan – San Remo 2016: Route maps, height profiles, and more. At 295 kilometres, the first Monument of the season is played out between Milan and San Remo. It boils down to a chaotic bunch sprint at the Via Roma. Gaviria hits the tarmac, thus diminishing his own and Sagan's chances. Arnaud Démare rises to the challenge and he powers to the win, besting Ben Swift and Jurgen Roelandts on the line. Saturday, March 19, 2016 - Milan-San Remo is the first Monument on the 2016 cycling calendar. 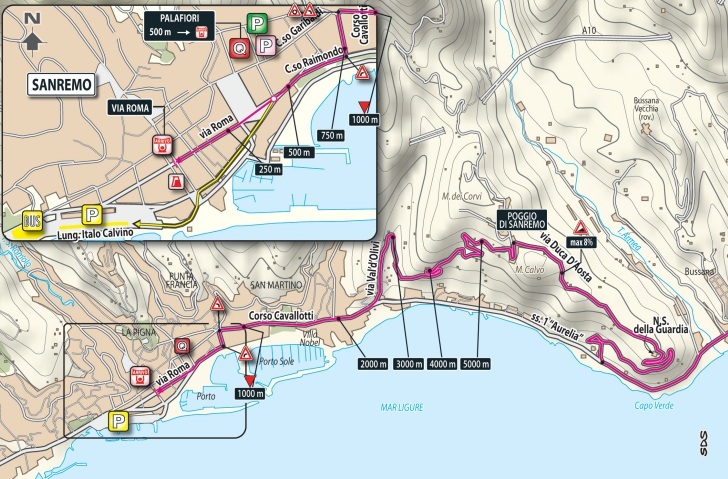 'La Primavera' is 295 kilometres and the finish is at the famous Via Roma in San Remo. Saturday, 19 March, Milan-San Remo is on the cycling calendar. The likes of Alexander Kristoff, Peter Sagan, Mark Cavendish, Fabian Cancellara, Nacer Bouhanni and Michael Matthews will be at the start, while title holder John Degenkolb is absent after a severe January crash. Cyclingstage.com brings you the contenders in Milaan San-Remo edition 2016.